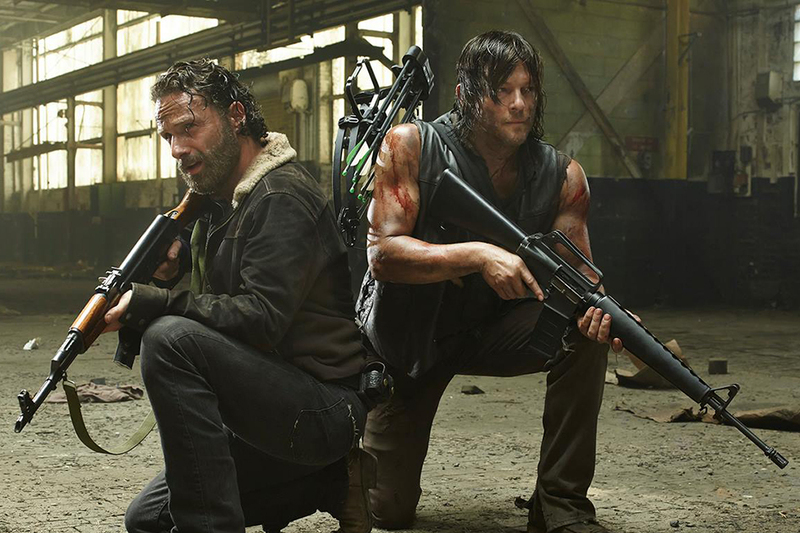 The Walking Dead launched its fifth season on Oct. 12, and judging from the record-breaking 17 million viewers who tuned in for the premiere, there is a pretty good chance that you already know what this show is about. The epic zombie saga, which is based off a series of graphic novels and first launched on AMC in 2010, chronicles the lives of several individuals in the aftermath of an apocalyptic event that has transformed 99 percent of the human race into reanimated corpses. The show deals with themes of loss, survival and the definition of humanity, and has throughout its run become one of the most popular cable dramas of all time. This season opens right where the fourth one closed; main protagonist Rick (Andrew Lincoln, Love Actually) and his team of survivors find themselves in the grips of a murderous band of strangers, yet again. However, it is (thankfully) not long until America’s favorite group of zombie killers escape danger and fully reunite with each other for the first time in what seems like years, at least from the audience’s viewpoint. Unfortunately, this welcome moment of peace and reunion is short lived as it soon becomes apparent that dark forces are closing in on Rick and company, posing a much greater threat than any undead walker ever could. With enemies closing in on all sides, our heroes cling to the hope of sanctuary and a cure that may or may not lie hundreds of miles away; however, only two episodes have aired, and already a few main characters will not be making it out of this season in one piece. So far, this season has amped up both the suspense and the brutality: the explosions are bigger, the undead decapitations are bloodier and the bad guys are creepier than ever. However, perhaps the strongest aspect of this season is the fact that the show has finally developed a strong core cast. After the first few Dead seasons were spent shaving off unnecessary (or decidedly unpopular) characters, the remaining survivors have become a familiar and weather-worn unit, capable of emotional depth and personal growth. It is this sense of emotional maturity that resonates throughout the small portion of the fifth season that has aired. After building an infamous reputation for killing off main characters with hardly any warning, Dead seems to be focusing more on life and hope this season than it ever has in the past; our group of heroes has never been stronger, but the stakes have also never been higher. Only time will tell if the future holds security or even more danger for Rick and the gang, but as it now stands, the show has never had a stronger sense of purpose; television’s horror phenomenon is back with a vengeance.